We have discussed before how President Franklin Delano Roosevelt was awarded an honorary membership in the Baker Street Irregulars in 1942, which can be read HERE. With the 2017 President Inauguration a few days away, this seems like a good time to review the four different inaugural medals of Roosevelt. We’ll discuss the medals in reverse order, with the most recent to the first. 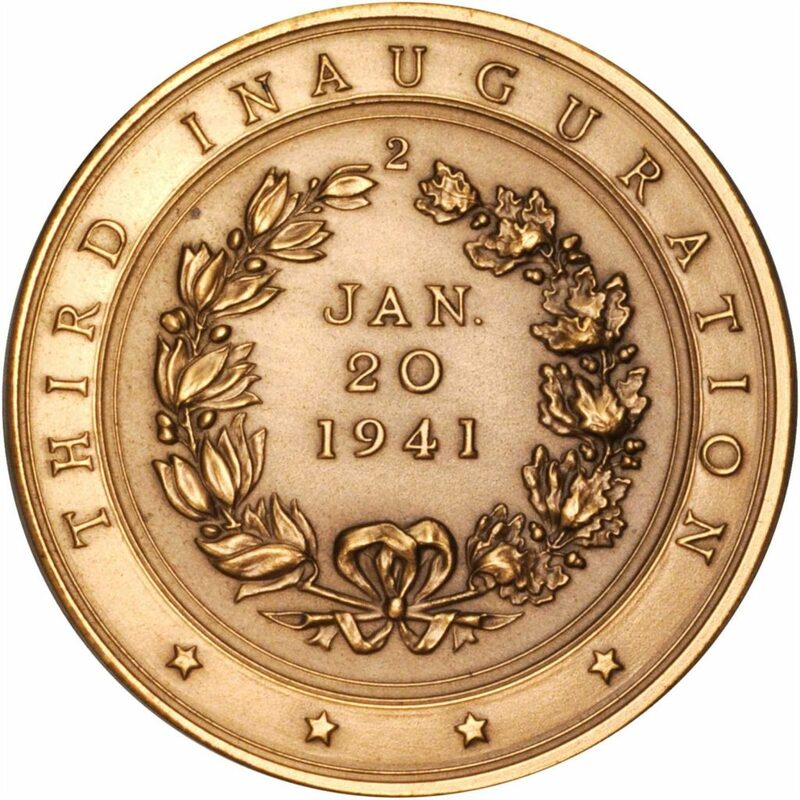 The 1945 medal for Roosevelt’s fourth inaugration was designed by Jo Davidson and 3,000 of the 45mm medals were struck by the United States Mint in Philadelphia. Examples are also known in gold and silver. Davidson’s design features a very gaunt Roosevelt, facing right in a Navy greatcoat and surrounded by the legend FRANKLIN DELANO ROOSEVELT ~ FOURTH INAUGURATION 1945. The U.S.F. 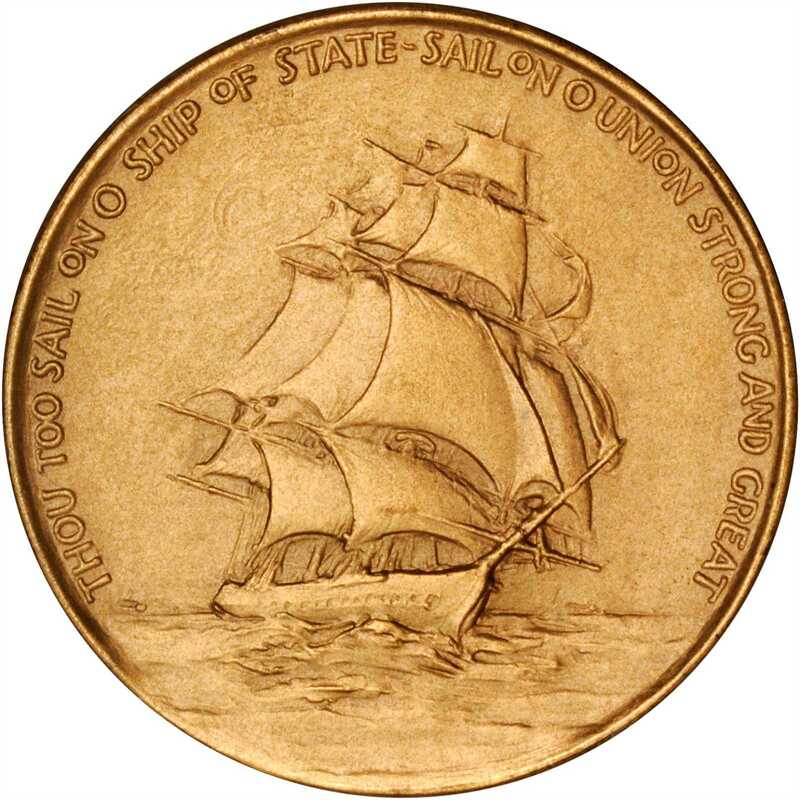 Constitutiion is featured under full sail on the reverse of the medal, with the inscription THOU TOO SAIL ON O SHIP OF STATE ~ SAIL ON O UNION STRONG AND GREAT around the border. The 1941 medals, unusually, were struck at the U.S. Mint with the agency’s design input, thanks to Roosevelt’s friend Nellie Tayloe Ross, director of the U.S. Mint, who was appointed chairman of the medals committee. The commission enlisted sculptor Jo Davidson to design the obverse, with U.S. Mint chief engraver John Sinnock designing the reverse. Davidson secured last-minute sittings with the president, modeling the portrait’s style after an ancient Syracusan gold coin. 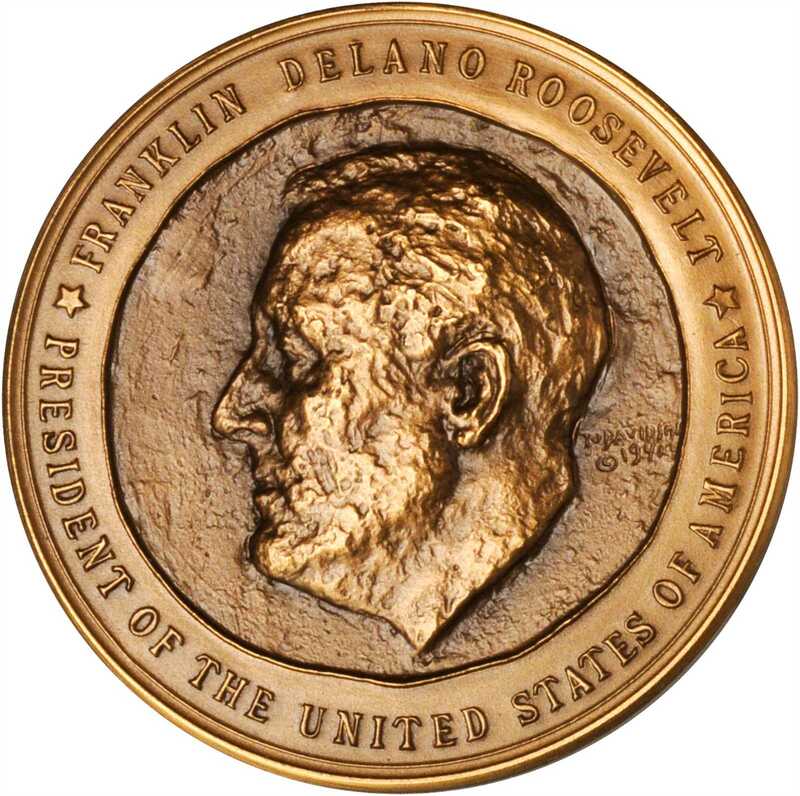 The obverse of the 42mm medal has a bust of Roosevelt, facing left, surrounded by the legend of FRANKLIN DELANO ROOSEVELT / (star) PRESIDENT OF THE UNITED STATES OF AMERICA (star). 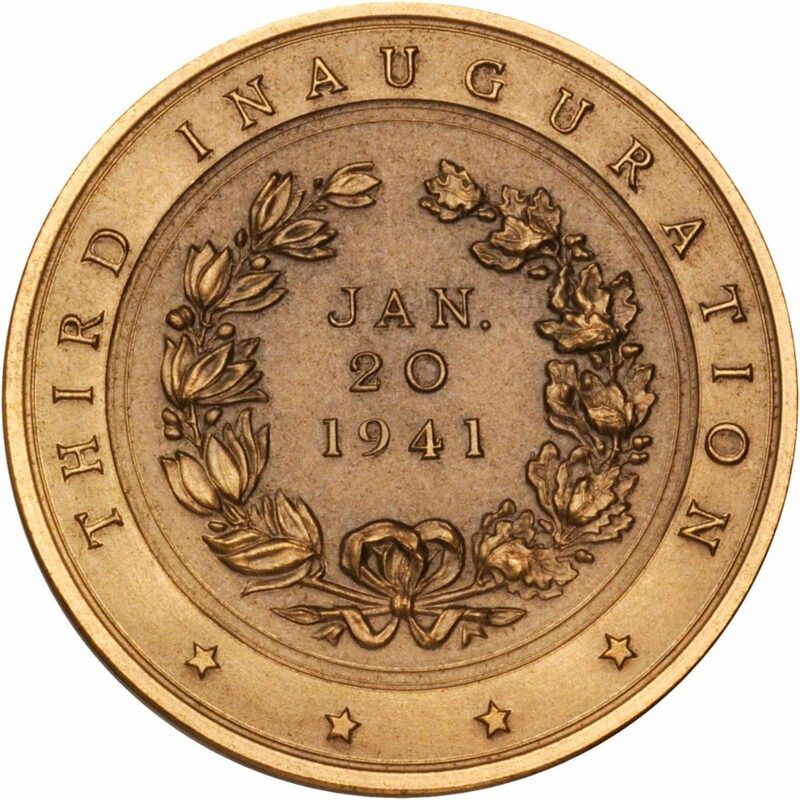 The reverse is a very basic design of THIRD INAUGURATION around the border and the date of JAN. / 20, / 1941 within a wreath. Some examples may have a small numeral 2 at the open end of the wreath. Following lackluster sales for the 1933 and 1937 inaugural medals, Roosevelt directed the committee to make the 1941 medals more affordable, according to The President’s Medal 1789-1977 by Neil MacNeil. At a price of $1, the medal sold out its mintage of 1,000 the first day of sale, and the committee authorized another 1,000 to be made. A small number 2, placed at the open end of the wreath on the reverse, distinguishes the second batch. Those too sold out and another 1,000 were authorized, also with the number 2 added. FDR was presented with a unique gold medal, and Davidson and Ross each were authorized to buy one of the two silver medals made. Readers may recall the name of Jo Davidson from our earlier post on the Hall of Fame for Great Americans medal series and his bust of FDR. Davidson also sculpted two busts that will be of interest to Sherlockians that we will discuss in a future post. Sinnock was the designer of the Roosevelt dime that you see in your pocket change daily and also designed a medal featuring R. Tait Mackenzie that we discussed in an earlier post. 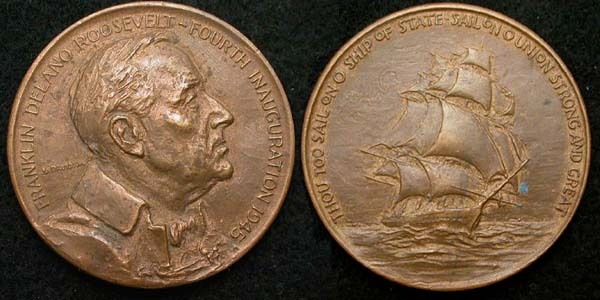 For Roosevelt’s second inauguration (the first to be held on January 20th, rather than in March), Joseph Atchinson, a Washington, DC based sculptor, designed this 76mm medal. 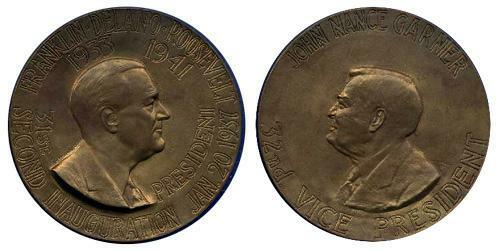 Tradition is that on a medal for a President’s second term, the vice president is also featured on the medal, so John Nance Garner appears on this medal. The fact that the wording on this medal is incused, and not raised, is highly unusual within the inaugural medal series. Over 1,000 medals were struck by the Medallic Art Company and did not sell very well. 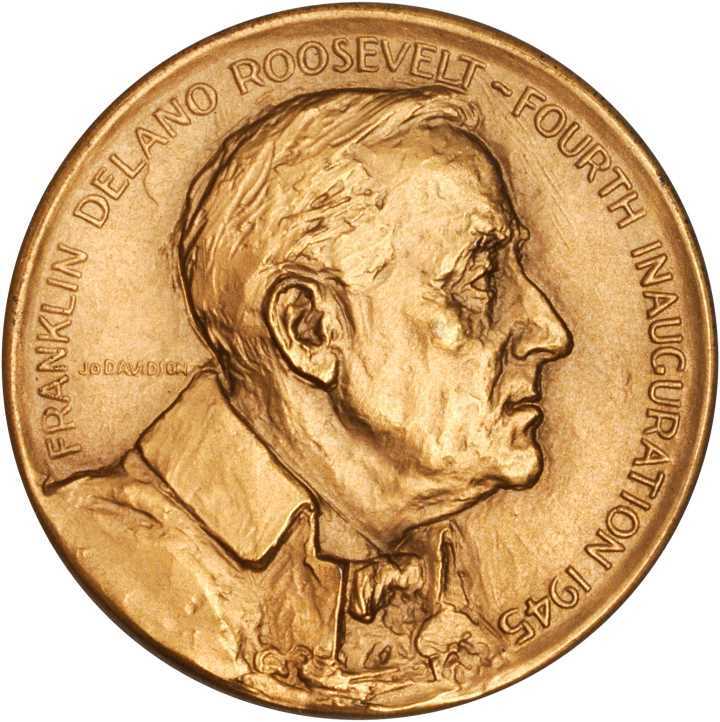 Roosevelt’s first inaugural medal was designed by Paul Manship, featuring a left facing Roosevelt on the obverse and the U.S.F. Constitution (this concept was used again on the 1945 medal) on the reverse. The 76mm medal did not sell at well, probably as a result of the Great Depression that was ongoing at the time. The dies for this medal were created by the Medallic Art Company, but the actual medals were struck in Philadelphia at the United States Mint. For those that have visited Rockefeller Center in New York (possibly during a BSI Weekend), the sculpture of Prometheus outside the building was done by Manship. He would also design the second medal in the Society of Medallists series, featuring Dionysius; and would also design the medal for John F. Kennedy’s 1961 inauguration. 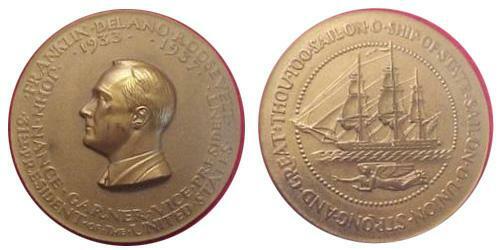 Manship would be honored as a Chevalier in the French Legion of Honour. 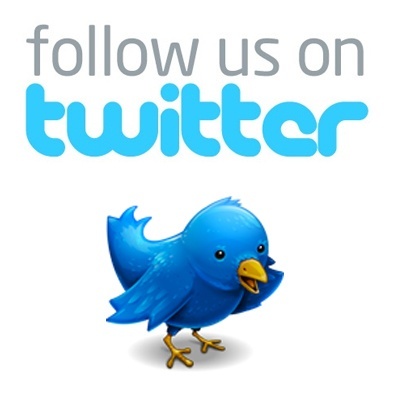 Trivia Answer – BSI Member on U.S. 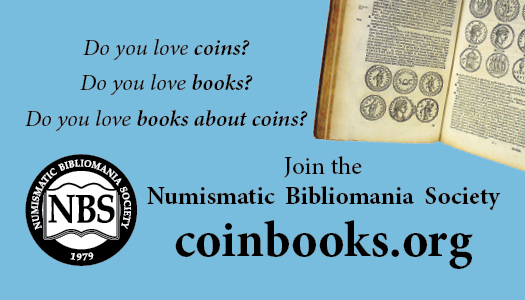 Coin?